Español retailed for $7.95 and came with a light green hugger cradle. Unofficially known as “Ocean Filigree,” Español, along with Raffia, was the first casserole released with a hugger cradle. “Spring’s Here,” exclaimed an article announcing the release of Corning’s newest Pyrex gifts. Included in the 1973 spring gift collection was Español, a 2 ½ quart Casserole (475) with a light green plastic hugger cradle. 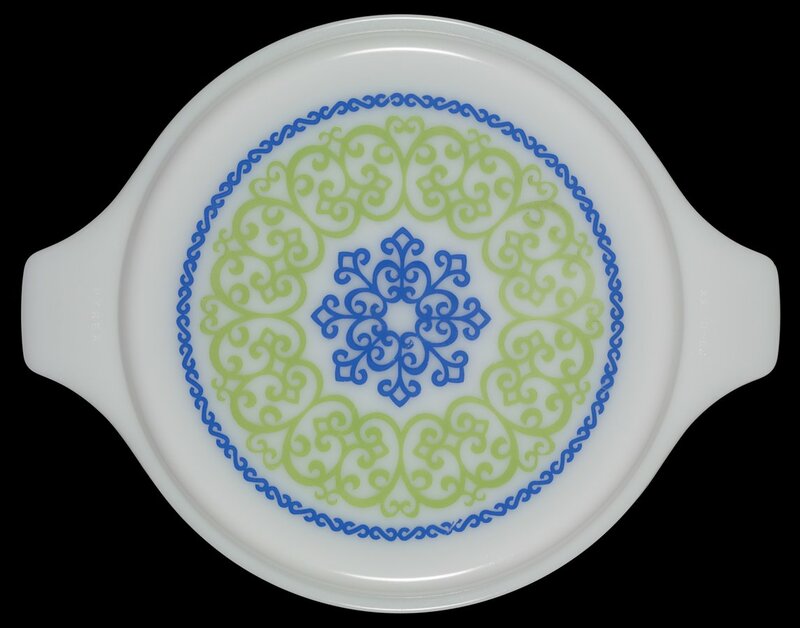 As the 1970s progressed Pyrex opal ware promotional patterns included small three-legged trivets, under-plates and “hugger cradles,” rather than traditional cradles and candle warmers. Español, along with, Raffia was the first casserole released with a hugger cradle.